A Russian Soyuz rocket experienced an anomaly shortly after launching toward the International Space Station on Oct. 11, 2018, forcing two crewmembers to make an emergency landing. 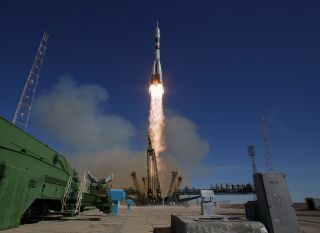 The next set of crewmembers should launch toward the International Space Station in December, despite the failure of a Russian Soyuz rocket earlier this month, NASA chief Jim Bridenstine said. That failure occurred Oct. 11, causing the Soyuz spacecraft carrying NASA astronaut Nick Hague and cosmonaut Alexey Ovchinin to make an emergency landing in Kazakhstan just minutes after liftoff. The investigation into the incident has been productive, and the Soyuz rocket likely won't be grounded for too much longer, Bridenstine said today (Oct. 23) during a meeting of the U.S. National Space Council in Washington, D.C. He didn't elaborate about that issue. But speculation currently focuses on one of the Soyuz's four strap-on boosters, which may have been attached to the rocket improperly before flight. Russian space officials have said that they'll finish their accident report by Oct. 30, though it's unclear when the findings of that report will be made public. Russian officials have also said they want to conduct three uncrewed Soyuz launches before using the rocket to loft astronauts again. And the current schedule should allow the next crew launch to take place Dec. 20, as currently planned, Bridenstine said. "NASA is regrouping, we’re replanning, and we’re getting ready to go again," he said. "We have a number of Russian Soyuz rocket launches in the next month and a half, and in December we’re fully anticipating putting our crew on a Russian Soyuz rocket to launch to the International Space Station again." That crew will consist of NASA astronaut Anne McClain, cosmonaut Oleg Kononenko and the Canadian Space Agency's David Saint-Jacques. But Hague and Ovchinin, who made it through their Oct. 11 ordeal safe and sound, will get another chance in the future, both NASA and Russian space officials have said. "They are not happy," Bridenstine said of the duo. "They want to be on the International Space Station, and they cannot wait to go again. So, we’re grateful for their enthusiasm." NASA is also grateful that the Soyuz's emergency abort system worked exactly as it was supposed to on Oct. 11, he added. "It's important to note that, while this was a failed launch, it was probably the single most successful failed launch that we could have imagined," Bridenstine said. Today's event marked the fourth meeting of the newly reconstituted National Space Council, which is chaired by U.S. Vice President Mike Pence. The meeting today focused largely on the efforts underway to establish a Space Force as the sixth branch of the U.S. military, a priority of President Donald Trump.